Create a contact that has 8 people in it to make group texting easier? Ok, I know this shouldn't be this difficult, but it's driving me crazy. 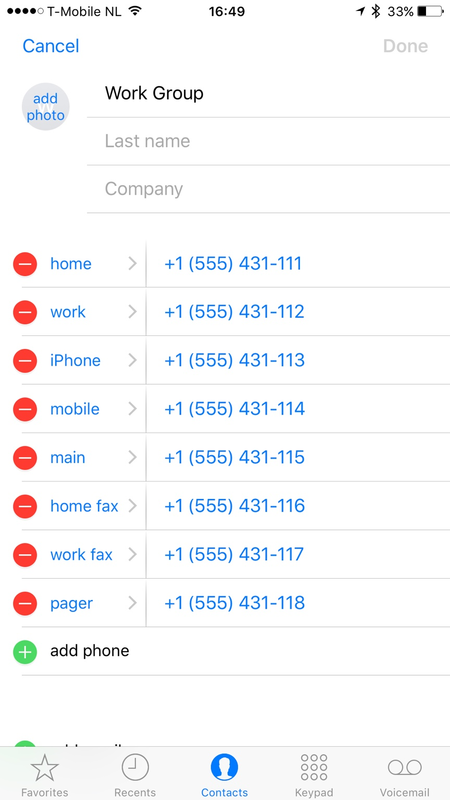 If there is a boss who wants to have 8 employees part of a group text, is there a way to have a WORK GROUP contact that contains all 8 Employee's names so that all the boss has to do is create a new iMessage and click on the WORK GROUP contact to populate the "to:" field with the phone numbers of all 8 people? I know this can be done manually and he can just keep revisiting the previous group text, but there should be a way to make a contact/group with multiple numbers in it to make this more streamline. It's actually as simple as creating a contact and saving all your employees numbers under it. And if you tap on the prefixes before the numbers you can give those numbers the names of the individual employees. However, if you ever get a phone call from one of them, you will see the actual contact name and the work group name appearing like 'John Doe or Work Group calling'. Wouldn't this just ask you to pick on of the number to text and not actually send it to all of those numbers? KillerQ and MoboPlay like this. Ooops. You're completely right about that. Apologies for that. I think this "boss" would just be stuck with entering all the employees into a text 1 by 1. Then the next time they can just type one of the names in the "to" section and the group of people should come up as a suggestion. Also if they don't want to have to create a new thread every time they could just leave it in there messages app and rename it "Work Group" by pressing the little i in top right corner. Yea, this was the first conclusion that I can't. It's strange that there are not other ways to do this in this day and age. I never do this myself, but there is an app in the App Store called Group Text+ that looks like it could do just this. So no easy way to create a text working group? You can, you just have to do it from iCloud unfortunately (on a PC, or perhaps from your phone requesting the desktop site). Either way, can't be done with just the phone and stock OS without either an app or iCloud. Why not just create a new message and then just attach the 8 people in it? You only have to do this once and then they can just go to the thread in iMessage from then on. Kind of this is understood to a bit more difficult then it really is. Put the work in once and then you won't have to worry about the contacts showing all funny during any call. Just a thought. I have in my Iphone 650 contacts while in Icloud only 112. how can i sync ? when texting from my ipad it show my email instead of phone number?